In August, I attended a very special sneak preview of Disney’s newest Tinker Bell movie, Secret of the Wings (now on Bluray/DVD and digital download as of October 23rd, 2012). The screening occurred at DisneyToon Studios in Glendale, California. DisneyToon Studios is responsible for putting out Disney’s direct-to-DVD sequels, as well as a couple that were released in theatres (Return to Neverland and The Jungle Book 2). After our screening, we were broken down into smaller groups so that we could meet with the individuals involved in making Secret of the Wings such an incredibly amazing film. My group’s first stop was to meet Ritsuko Notani (Character Designer) and Lorri Broda (Associate Producer). 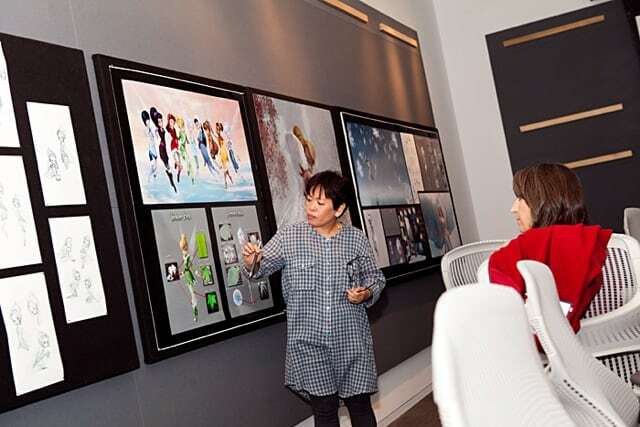 Ritsuko Notani is the mastermind behind the designs of all of the main Disney fairies in the Tinker Bell films (Tinker Bell, Rosetta, Periwinkle, etc.). Lorri Broda, the associate producer, ran us through the costume designs the characters (Periwinkle’s is made from a plant called lamb’s ear, in case you are wondering) and also talked about Periwinkle’s incredible hair. Periwinkle’s hair is inspired by a “frost flower”, which is actually an ice crystal! The Disney team brought in a snow expert to get them familiar with all things winter related. So that they could see Periwinkle’s hair from all the different angles, Disney brought in celebrity stylist Ken Paves, who has styled the hair of Jessica Simpson, Victoria Beckham, and Eva Longoria, to name just a few. Our second visit of the day was with Fred Water (Art Director) and Nickie Haui (Lead Lighting and Rendering). This was their second time working together; they also were paired on Pixie Hollow Games (this is a bonus feature on Secret of the Wings Bluray/DVD). 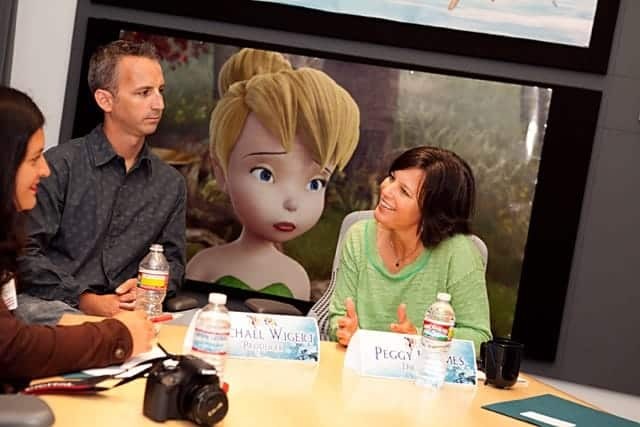 Fred Warter talked about their biggest challenge with Secret of the Wings: visualizing the emotional/wings connection between Tinker Bell and Periwinkle. The first step in discovering this was going to the story boards. After this, director Peggy Holmes would sometimes provide live action references as to how things should play out in the animation. 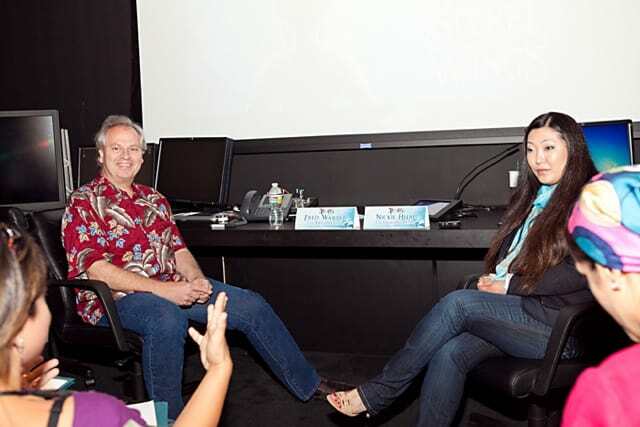 John Lasseter (Chief Creative Officer of DisneyToon Studios) also gave his expertise to this film, challenging Warter and Huai to take it to the next level with Tinker Bell’s and Periwinkle’s wings. Warter’s first instinct was to draw attention the veins in the wings (each fairy has his/her own unique vein pattern). Next, Warter decided to add some color to the wings. They kept in mind Lassetter’s advice of always “looking to nature” for inspiration, and began studying wings of insects and hummingbirds, and even the effect of oil in water. They finally found what they were looking for in the abalone shell. Nickie then took Warter’s designs and incorporated them into 3D. Our third visit was with Paul McGrath in the recording studio. 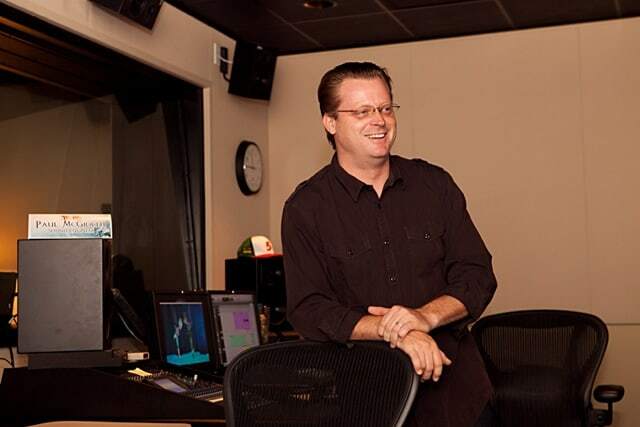 DisneyToon Studios does all of their recording right on site. We were given a short demonstration on how the process works, and some members of our group even got to go into the recording booth to lend their own voices to the characters Tinker Bell and Periwinkle. This area of the studios is completely sound proof, and it would have to be, since the location of the studio is next to train tracks. For me, this was the most exciting part of the day. I enjoy writing, and creating new characters, and I was completely mesmerized by the amazing storytelling and imagery of Secret of the Wings. Michael Wigert (Producer) and Peggy Holmes (Director) worked together for the first time on this film, and they make a terrific pair. They were very at ease with one another, cracking jokes, laughing, and having a great time while we talked with them about the film. Peggy Holmes was the screenwriter as well as the director for this film; this was her first time working on one of the Disney Fairies films, so she looked to the previous films as well as all of the information the studio has compiled for the franchise. Now having finally seen the first movie, Tinker Bell, I am able to see how they took certain elements from that film and incorporated them into Secret of the Wings. I am so impressed with how much thought went into writing and making this film. The filmmakers took John Lasseter’s advice to “look to nature” to help out with the story, so Peggy did a lot of research on winter, snow, and various plants; much of what they learned became very integral to the story. Peggy also drew from her personal experience of having a close bond with her sister to make the relationship between Periwinkle and Tinker Bell believable. Thanks for telling us all about your visits to the making of the Disney movie Secret of the Wings. I bet that was fun getting the things needed to draw your own picture of Periwinkle and having help too. I sounds interesting hearing how they created characters and make up the story line. Its always fun learning how movies are made. We love Disney movies , their the best. Fascinating story. We don’t often think about how much work goes into our entertainment. Looks like an amazing movie. I can’t wait to see it. Looks like alot more work goes into to it than I thought! What a great trip & learning experience. I’m always amazed at how much talent and effort is put into each Disney film.